The WA Newborn Hearing Screening Program provides a free hearing screen for all newborn babies at public, private, metropolitan and regional maternity services across Western Australia. The program is funded by the Department of Health and coordinated by the Child and Adolescent Health Service. Why screen your baby’s hearing? In the first few months of life, it is very hard to tell if your baby can hear by watching their behaviour. Your baby needs to be able to hear all of the softest speech sounds to develop their speech and language. A free hearing screen is available to all babies born in WA. Around one to two babies in every 1,000 are born with a hearing loss in both ears (bilateral). Most babies have no known family history or risk factors. Newborn screening enables any hearing loss to be identified and managed as soon as possible. Early intervention helps your baby’s speech, language and learning development. Your baby’s hearing will be screened by Automated Auditory Brainstem Response (AABR). Three separate leads are gently placed on your baby’s forehead, the back of the neck and near the shoulder using small lightly adhesive pads. A small earphone ‘cup’ is gently placed over each of your baby’s ears. 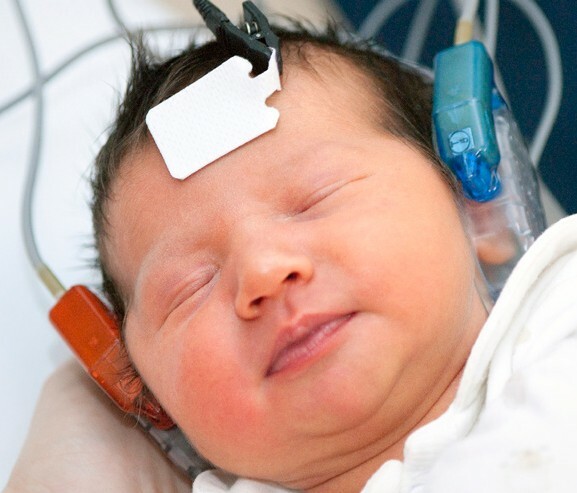 Soft clicking sounds are played, and the screening machine measures the responses from your baby’s ears. The screen doesn’t hurt your baby in any way. When is the screen performed? Screening may be done at any time after your baby’s birth, usually before you leave the hospital. If your child misses the hearing screen, please contact your birth hospital. If your baby transfers between hospitals, discuss this with the nursing staff on your new ward. It is really important that your baby completes their screen. A follow-up screen will be recommended if there are any concerns about the results. A few rare causes of hearing loss are not picked up by the standard hearing screen. In some cases, a baby’s hearing may be normal at birth but gradually worsen over time. Syndromes associated with hearing loss, such as Down syndrome. The hearing screen measures your baby’s hearing responses at the time of the screen only. Sometimes babies can develop a temporary or permanent hearing loss at a later age. It is important to monitor your baby’s hearing as they grow. These milestones can be used as a guide, but please seek medical advice if you are unsure. Recognises your voice and quietens when you speak. Turns head to soft sounds. Begins to copy speech sounds. Please contact your GP, child health nurse or paediatrician if you have any concerns about your child's hearing ability or language development.